Us states maps PowerPoint templates, backgrounds Presentation slides, PPT Themes and Graphics. Download royalty-free US States PowerPoint maps templates from SlideGeeks. Our team of expert designers has created a fully-editable map diagram for each of the 50 states of the United States of America. This includes maps of Alabama Alaska Arizona Arkansas California Colorado Connecticut Delaware Florida Georgia Hawaii Idaho Illinois Indiana Iowa Kansas Kentucky Louisiana Maine Maryland Massachusetts Michigan Minnesota Mississippi Missouri Montana Nebraska Nevada New Hampshire New Jersey New Mexico New York North Carolina North Dakota Ohio Oklahoma Oregon Pennsylvania Rhode Island South Carolina South Dakota Tennessee Texas Utah Vermont Virginia Washington West Virginia Wisconsin and Wyoming. SlideGeeks is your one-stop-shop for all PowerPoint maps. Make them yours today! These high quality, editable powerpoint state maps have been carefully created by our professional team to display location and other geographic details in your PowerPoint presentation. Each map is vector based and is 100% editable in powerpoint. Each and every property of any region - color, size, shading etc can be modified to help you build an effective powerpoint presentation. Use these maps to show sales territories, business and new office locations, travel planning etc in your presentations. Any text can be entered at any point in the powerpoint map slide. Simply DOWNLOAD, TYPE and PRESENT! Take the escalator with our Editable Usa California State PowerPoint Maps. Reach higher levels with relative ease. 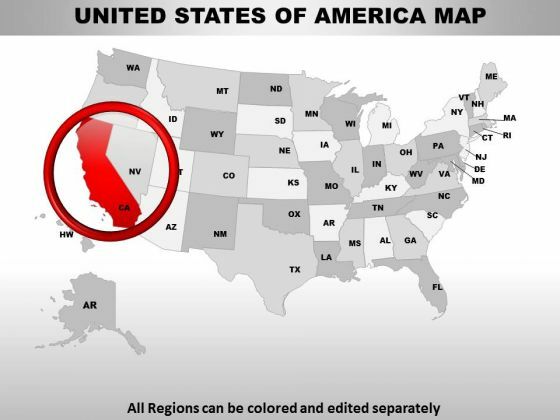 Explain succinctly with our Editable Usa California State PowerPoint Maps. You will come out on top.